once the home of Chibas Jerusalem, collapses. Chibas Jerusalem (Love of Jerusalem), founded in 1904, built this structure in 1926. 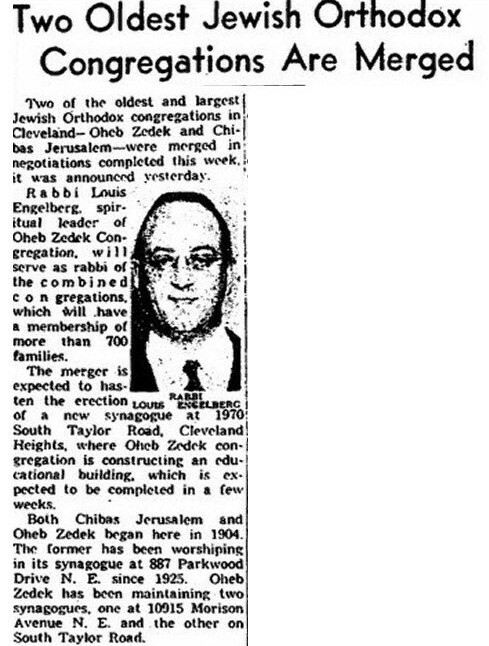 In 1952, with many members now living in "the Heights", it merged with Congregation Oheb Zedek to form Taylor Road Synagogue. In 1953 it sold this property to a church. The building has been vacant for many years. 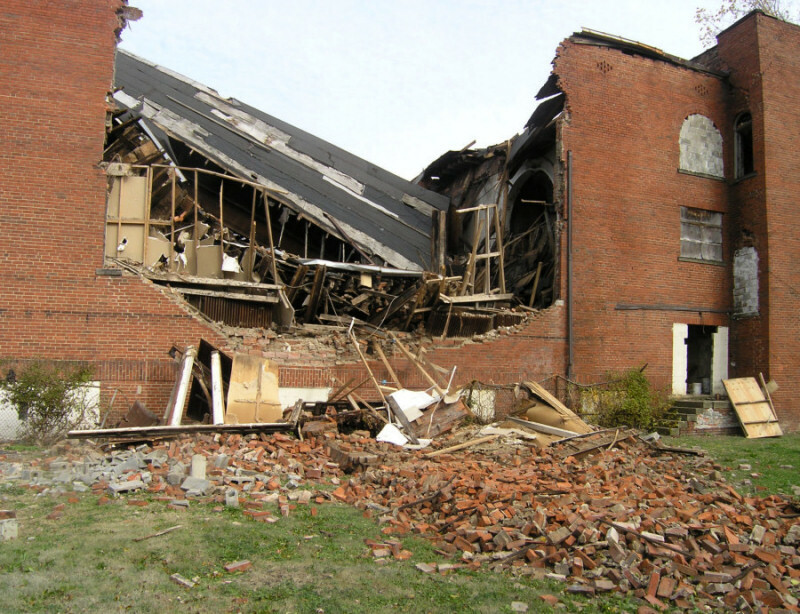 The building, unstable and dangerous to enter, will soon be demolished. A stained glass window, salvaged from the Chibas Jerusalem building just before the museum opened in 2005, is one of the many treasures at the Maltz Museum. See February 23, 1952 Plain Dealer story below. Rabbi Engelberg (1910-1997), Oheb Zedek's first American-born, American-educated rabbi, had succeeded Rabbi Israel Porath in 1939. He would serve Taylor Road Synagogue until 1984. For a time Taylor Road Synagogue was the largest Orthodox synagogue between New York and Chicago. 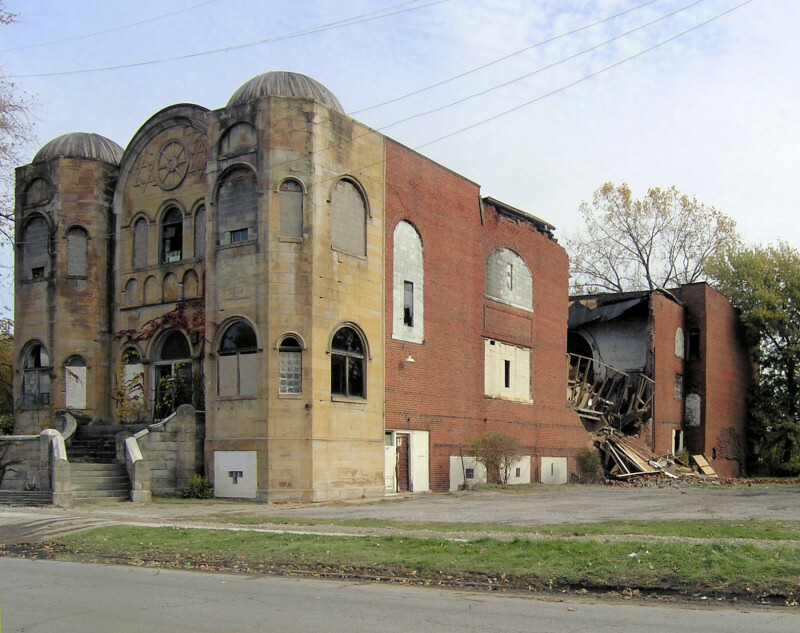 On May 12, 1985 the congregation held the first Orthodox Bat Mitzvah in Cleveland. Read PD story. "Photo by Arnold Berger, on www.ClevelandJewishHistory.net"